Is Anyone Using Amazon’s Other, Non-CreateSpace, POD Service? 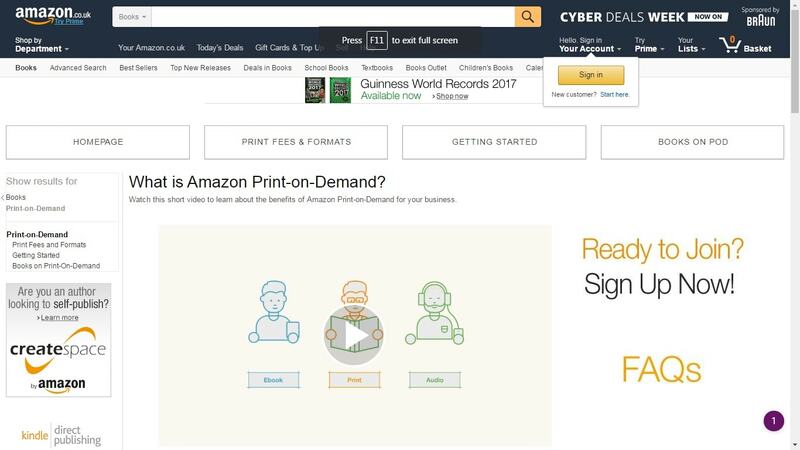 We've known Amazon has been deeply interested in recruiting authors and publishers to use its print-on-demand service ever since it used blackmail to compel publishers to sign up with BookSurge in 2008 (now known as CreateSpace). In all that time I've only heard of the POD service being called either Createspace or Booksurge, but apparently Amazon is now distinguishing between Createspace and a second POD service. The second service is called "Amazon POD", and it is only open to publishers (*). Amazon POD has been around for at least a couple years, but it only crossed my desk this week when Mark Williams found the one public mention of it on Amazon.co.uk (I can't find it on Amazon.com). Mark got bent out of shape over the fact that authors are excluded, but it's not clear that they are missing much. The pages on Amazon's UK site revealed that Amazon POD covers the US, UK, Japan, and the Eurozone, and according to the contract (which was last updated in April 2015), Amazon POD has the exact same costs as Createspace (source). Amazon POD is run by CreateSpace (the contact email address is [email protected]), and there is in fact little to distinguish between the two, but Amazon is promising several benefits which authors might not be receiving through Createspace. Books distributed through Amazon POD are eligible for Amazon Prime and next-day delivery, and if a publishers puts all of their titles through Amazon POD they can save 10% off their costs. So who is using Amazon POD? Amazon says that a number of small publishers have signed up, including Packt, Head of Zeus, and Sage. They have also identified titles by Time Inc, Lake Union (an Amazon imprint), Cambridge university Press, and Palgrave Macmillan as having been distributed through the Amazon POD service. Yes, Amazon said that a Big Five publisher is using Amazon POD. Given their frequently contentious relationship, I was as surprised as you, but in a way it makes a lot of sense. The real value of POD is that it eliminates storage costs. Publishers don't have to invest capital in a print run which might end up moldering away in a warehouse; instead the books are printed as needed. This is ideal for backlist and other titles which are in low demand, so one would expect to see it used heavily in academic publishing where the average print run has already dipped into three digits. If you know of a publisher who uses this program, let us know in the comments. I'm especially interested in first-hand reports. What did you think of it? I think this has the potential to change publishing a lot. Right now publishers have to guess which books will sell well, and if they guess wrong, they lose a lot of money. POD allows them to wait and see what sells. I would also expect this could have an impact on authors’ contracts. Right now authors get the rights back if a book doesn’t keep selling because it’s hard for the publisher to make money on tiny sales, but POD could change that. Time will tell! Academic publishers have been using POD for backlist books for a decade or more. Most of the bigger jobbing printers can do POD books. Amazon will win business if they can offer lower prices with adequate quality. Great article, I was not aware of this either. There are several aspects which jump out. For one, this is similar to the Amazon Advantage vs. Amazon Seller Central. Amazon Advantage is for media publishers. There are many advantages such as being able to consolidate listings, take control over the metadata, and of course have Amazon as the seller of record and the buy box. Discounts look to be the same at 55%. This is steep but one can adjust prices to get the same profit margin, and importantly, increased sales. Compared with LightningSource (not Spark, but the original publisher accounts) payments are within 30 days (or between 29-61 days), instead of the 90 days+ of LightningSource. Also the idea of next day availability is pretty big when it comes to impulse sales, whereas if Amazon draws from Ingram, there can be a delay of days to weeks, and that sends an unwelcome message of less-than-popular. Note that there appear to be four websites for this service, and the US one uses “CreateSpace” as the brand, though it does have the publisher-focused option. Thanks for the extra details, and great find on the websites. I couldn’t find anything in Google. So are CreateSpace titles, aren’t they? I just checked, and I think both my CreateSpace-printed novels are in Prime, though it looks like next-day delivery isn’t possible. I had found a bunch of CreateSpace titles which weren’t in Prime. Amazon are another faceless company offering a POD service which doesn’t offer a lot of key features which I’m currently receiving from another provider. I’m receiving a better price and a better finish. I speak for myself here but I think that’s really the goal: quality books for mainstream prices. This is very old news, as in maybe a decade. In the U.S., it’s called CreateSpace Enterprise. Frankly, considering the required discount, I don’t understand why anyone with a choice would be interested. I see mention of “CreateSpace Enterprise” on the Aaron Shepard blog dating from 2012, but no actual Google hits for at least the past year, besides this the-digital-reader blog post. 4 years is not a decade, but may seem like such in the publishing field. What I wrote on my blog in 2012 was “In two ways, CreateSpace has already been in Europe for quite some time. CreateSpace’s Enterprise customers—bigger, more established publishers—have been able to publish also through POD operations run by Amazon UK and Amazon Germany.” I had an Enterprise account myself in 2009, when I was migrated from BookSurge. So, no, not QUITE a decade. I eventually had my books transferred to a regular CreateSpace account for convenience. And now, seeing what has become their standard terms for Enterprise, I wouldn’t even consider it. This is now obviously only for those publishers who have already been forced by Amazon to grant inappropriately high discounts — discounts that are normally reserved for wholesalers and that have helped Amazon drive competitors out of business.